A Grand Rapids City Commission meeting had to end early last night, after protestors disrupted the meeting. The protestors, organized by Movimiento Cosecha GR, called on the city to end all police cooperation with Immigration and Customs Enforcement, also known as ICE. “ICE and cops go hand in hand,” dozens of protestors shouted, while standing in front of commission members. Mayor Rosalyn Bliss was able to convince the group to end the chants during one disruption early in the meeting. But toward the end, with several people still in line to give public comment to the commission, the group started up again. “Can we give other people an opportunity to speak?” Bliss pleaded over the chants. “I have to adjourn. I’m sorry,” Bliss said, and banged a gavel to close the meeting. The protests came because of the case of Jilmar Ramos-Gomez. He’s a U.S. citizen who grew up in Grand Rapids and served as a Marine in the war in Afghanistan. He was detained by ICE last December, based on a tip that originally came from a Grand Rapids Police Department captain named Curt VanderKooi. Yesterday GRPD released its own internal affairs report on the incident, which cleared VanderKooi of racial profiling. Ramos-Gomez was originally arrested by GRPD for setting a small fire and breaking into the helicopter pad area at the roof of Spectrum Butterworth hospital in Grand Rapids. 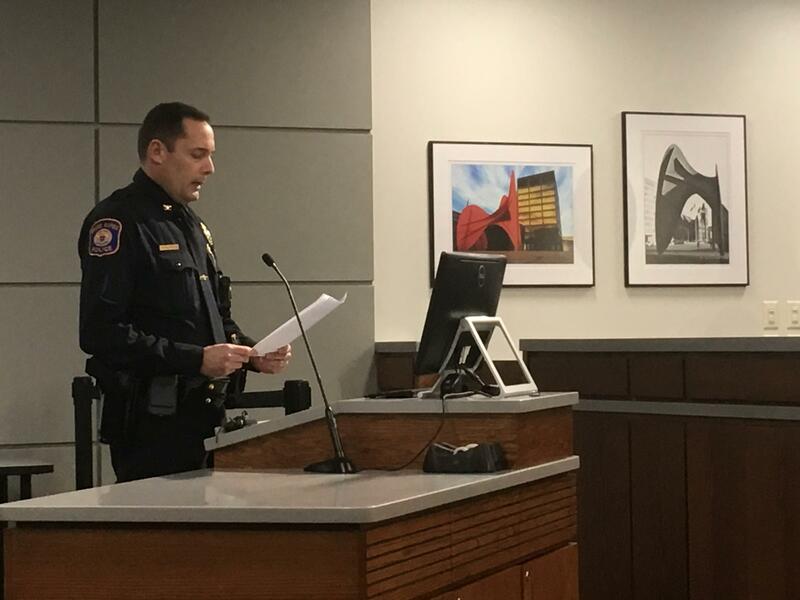 Acting police chief David Kiddle told commissioners last night VanderKooi was justified in contacting ICE because VanderKooi believed Ramos-Gomez’s actions could be part of a terrorist plot. Grand Rapids interim police chief David Kiddle reads from a statement at last night's city commission meeting. GRPD's internal affairs investigation did fault VanderKooi for one thing. It said he used "unprofessional language" in his communication with ICE. In one email, VanderKooi used the word "Loco," the Spanish word for crazy, in a subject line. Ramos-Gomez's family says he suffers from PTSD as a result of his combat service. Kiddle read from a statement he said VanderKooi asked him to share. "It was not my intent to disrespect Mr. Ramos-Gomez, or offend anyone in any way," Kiddle said on behalf of VanderKooi. "I am sorry for any hurt this has caused Mr. Ramos-Gomez and our community." But the members of Movimiento Cosecha GR, and others at last night’s meeting, didn't seem to accept the apology. “I am here because Captain Curt VanderKooi, a commanding officer – not a rookie cop – a commanding officer, from where I stand is not fit to lead,” said Mary Alice Williams. Documents released by the Grand Rapids Police Department and the ACLU of Michigan show that Ramos-Gomez had his passport in his backpack when he was arrested. GRPD had that passport in its possession during his detainment. Because of the protests that ended the meeting, commissioners didn’t give any of their own comments on the incident. But, early in the meeting, city manager Mark Washington noted there are more actions the city can take to review the incident, including through the city’s Police Civilian Appeal Board. The Kent County Sheriff’s Department is changing its policy on cooperation with Immigration and Customs Enforcement.